Competition is something everlasting and permanent. It always has been, it always will be. This aspect mainly plays an influential role in matters relating to eCommerce in 2018, whatever you’re selling. Put yourself into in the eStore visitors' shoes: what makes web-wanderers convert into customers or not convert at all? What drives them while progressing through your site? And how can you turn run-of-the-mill, unprofitable online shop into a prestigious brand with lots of people admiring it? Sorry, this is way beyond you. Such a task may be carried out only by a top-class shopping platform. 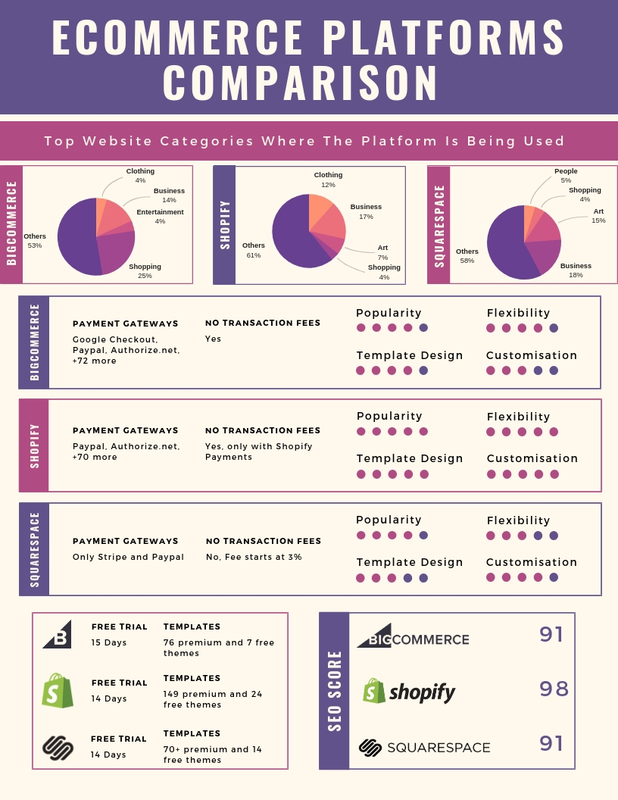 So, the one and only thing you need to do is carefully look through this Squarespace vs Shopify vs BigCommerce comparison. Determine which one performs better and go in the new season with new powers! Matching Squarespace to Shopify or BigCommerce, you can discover a new treasure trove of functionality to migrate to. Gone are the days of boring and generic websites, today ball’s in your court. How to dispose of it? Keep calm, Cart2Cart will show you. Most people start by looking at the pricing page, so we’ll start there too. Hope you get it: low prices should not be the number one priority when choosing an eCommerce builder. Quality over money, always. It’s just a small component, that should be considered equally alongside mutually advantageous features that benefit you and your shoppers. Squarespace offers four plans priced between 16 and 46 $ monthly. The discount system is applied to customers, who sign up to an annual plan. They can save from 13% to 25% instead of paying more on a month-to-month basis. As to Shopify pricing, just for the record, quality always costs. But we can't think of a part in the sales process where a certain platform is cheaper than Shopify. There is none! Basic is $29 per month (and 2.9% + 30¢ per transaction). 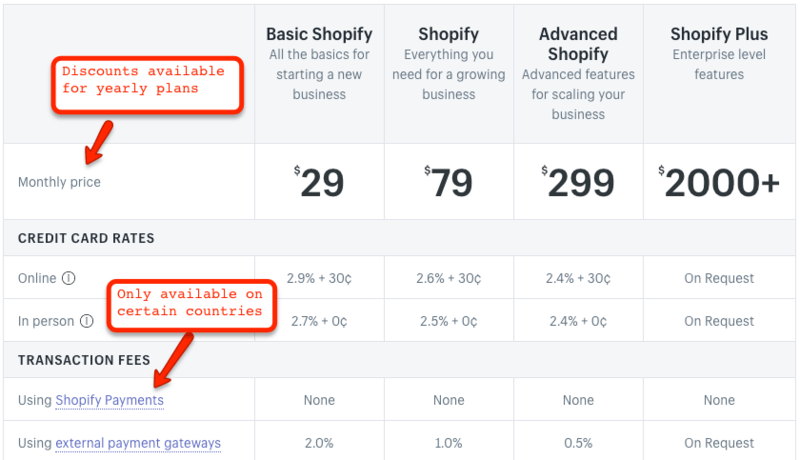 The Shopify plan tier is $79 monthly (plus 2.6% + 30¢). The Advanced costs $299 monthly (and 2.4% + 30¢). Shopify Plus plan starts at $2000 a month. Special Lite add-on for selling on Facebook requires only $9 monthly. BigCommerce pricing isn’t drastically different. It has on offer four subscription options paid monthly or annually. 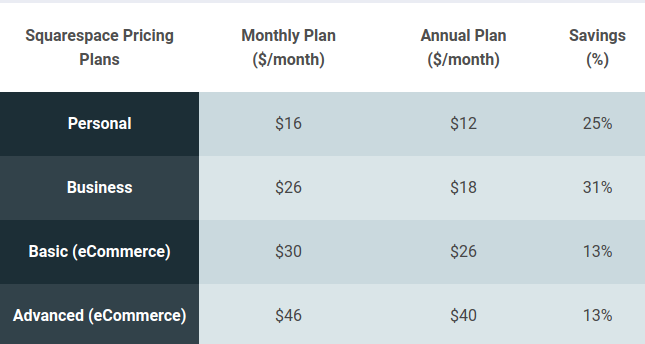 When billed monthly, the Standard plan is $29.95, the Plus plan costs $79.95, the Pro plan tier is $249.95, and the Enterprise plan employs customised pricing. Premium features for running an enterprise-level business are available only for more expensive and advanced payment programs. And one more thing: there’ll be no discounts for picking up an annual plan. Squarespace helps you to update the site quickly and to handle media managing by yourself instead of hiring an outside developer. This simplicity doesn’t require having IT team behind you. As for drawbacks, if you don’t understand all the features entirely and don’t use them, there is a chance to miss something. In a nutshell, creating an eStore with Squarespace is easy...when you know how. Track customer and order details. The dashboard is intuitive and detailed, and it allows adjusting and managing new products and orders. The whole process can be performed straight from this Dashboard. You are allowed to use it for generating discount codes or to examine the latest reports. Look for various free and paid apps to enhance your store. Create your own pages to empower customers to contact you at any time. The setup process was pretty streamlined, with no bumps and security concerns to slow it down. Simply put, run the business that you deserve. Which cons, there are no cons! BigCommerce put time and care into making sure you won’t have to be passionate techies to create customer-friendly pages. This aspect is critical for the confidence in our business: no third-party experts to keep things under control, you can do it by yourself in those few minutes of free time while working. Considering the considerable amount of features, BigCommerce is reasonably easy to use. However, the sheer volume of options can sometimes be a bit overwhelming, for example: in a tax setting. Squarespace doesn’t provide phone support. From the very beginning, you’re prompted to fill out the short questionnaire, select an appropriate topic, relating to your problem, email them and wait. Their service offers support during business hours, but for site-building related issues, there is a Squarespace help Center, which contains tutorials, community answers and knowledge base. Shopify is an all-inclusive system. Their support team seems to understand all problems even when you don’t know how to explain them adequately. They always care about their customers, they regularly release new tools and options. Shopify merchants can take advantage of 24/7 email, live chat and phone support. Also, you can get a response to specific questions via Help Center. Besides, you can access video tutorials, crowdsource through Shopify Community and watch webinars to find solutions. BigCommerce is backed by a proper IT company, not just a wannabe experts who promise technical support but deliver nothing. They are there for you 24/7, naturally speaking English, and most of all they are technically knowledgeable. In case the agent comes across an issue he can't solve, you're automatically directed to fill a trouble ticket, and to let an expert team examine the data and resolve the problem. But nothing’s ever perfect. The tutorials and instructions for particular aspects of BigCommerce can be very outdated. BigCommerce’s inventory reporting features are fundamental and lacking helpful information, which makes it a painful chore to assess my inventory of certain products and classes of products. Good design is a good business, right? But this high quality requires specific resources to be reached. Squarespace templates (70+ free and 14 premium themes) are modern, good looking and professional. They really care about your websites to look professional and secure. Depending on the theme you decide to go with, lots of subtle visual effects are in play, such as parallax scrolling and text that gracefully fades in and fades out as users scroll through a site. Thanks to an integration with Getty images you’re able to enhance your design even more. This provides you with an easy and affordable way to add stock images to your website — images cost $10 each, plus VAT where applicable. However, of 70+ themes to choose from, only 12 are particularly dedicated to the online store. Shopify is how ecommerce should look and be done! The top-notch feature are probably Shopify themes (149 premium themes ($100 – $180) and 24 free ones), because, believe us, you won't have a more beautiful store anywhere else! They look gorgeous, minimalistic and stylish. If you're a designer or a developer it will be even better, you can design personalised solutions! Moreover, when you start using Shopify, you will easily customise them without much knowledge in developing and programming languages. The 10 templates that are provided with Shopify contain a few variants for each theme, meaning there are actually more free options than the number ten suggests. There is an excellent variety of BigCommerce templates (7 free and 76 premium ones, which vary in price from $145 to $235), to make your website attractive, and you can even customise them to make it feel personal. Each theme, both paid and free, includes an additional two, three or four styles your site can be changed to. They are slightly-altered versions of your original theme — the significant difference being a change in layout and colour. Note: BigCommerce does not provide technical assistance for uploading themes. It’s all well and good having a beautiful online shop but if no-one visits you’ll be pulling down the virtual shutters in no time. Squarespace has some issues when it comes to SEO, they could make it more clear to its customers. So if you search an SEO friendly website, you’ll need to do some thorough research over Squarespace because if you stick to its essential recommendations, you cannot optimise them correctly. Unfortunately, Squarespace doesn’t allow writing own metadata descriptions. Title tags, meta descriptions, URLs for blog posts, web pages, products, and collections. Going up! Free analytics & SEO tools that allow you to track visitors, control sales, monitor conversion rates and refine search results. Squarespace doesn’t require coding knowledge to make a beautiful and eye-catching design. Takes minutes to digest the concept, and that's, in fact, the only step to make before placing a product on sale. The best thing about Squarespace's interface is its drag and drop style ‘layout engine’ which is really fantastic for organising and showcasing your content in a variety of ways. However, it can be a bit sluggish at times and crashes a bit more often than you’d like. Shopify? Everything there is made to be easy! If you take images, for example, you add them with a drag-and-drop mechanism. If you take product descriptions, you can copy-paste them into the section boxes (drag-and-drop works here too). Make your own updates from time to time, make changes to alignment, headings, add links, labels and optimise content for SEO to help your shop come to life, and convert marketing qualified leads. Shopify provides everything you need so you can better manage all your sales processes. There everything happens with the blink of an eye. BigCommerce is pretty straightforward to use and customise. It has clean, well-organised interface with the menu on the left which you can use to access key functionality and an area on the right which can be used for uploading/editing content and products or viewing data. For instance, if you want to make edits to your homepage or something else — go to “Storefront” from the main Dashboard. There you can access nine vital elements of your website: themes, logo, social media links, homepage carousel, footer scripts, web-pages, blog, Akamai image manager, email templates. You’ve already understood, that Squarespace is user-friendly content management software that allows you to create personal websites for running your small businesses, blogs or you can use it to build your own online portfolio. It offers various types of design to choose from, or you can create your own design to meet your demands. The team behind this product is extremely helpful. But...it’s definitely not the choice of winners. Especially, when being compared with such eCommerce giants, as Shopify or BigCommerce. Shopify’s interface looks so clean and well-organised that it is almost impossible to mess up, and you're guided through sales smoothly and seamlessly. It was designed to help you to focus more on marketing instead of building a website. It is affordable, and you don’t have to spend a vast amount of money to use the platform. It offers excellent integrations, helpful selling channels and unique features that cannot be found in other solutions. BigCommerce is applicable for businesses of all sizes. In fact, it currently powers over 55,000 small business ecommerce companies worldwide, leveraging the solution’s capabilities to place them in equal footing with larger enterprises. They are the ones eager to develop your business, and they suggest ideas you'd never come across yourself. Then, there are tones of seamless applications, customer support teams that do the impossible to help you and to provide advice, and a wonderful fellowship of developers, affiliates, traders, and other users to work hand by hand with you. All of this being said, the platform values the money you're giving it. 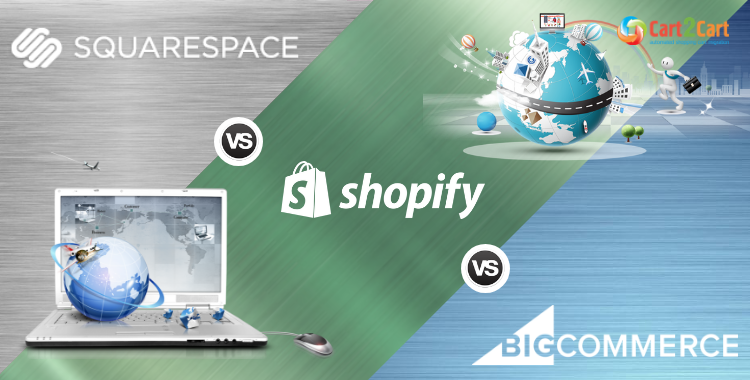 Are you ready for drastic changes, having read Squarespace vs Shopify vs BigCommerce comparison? The main thing is to start, and Cart2Cart will teach you how to do it right. Experience the best-quality migration service ever to transfer your data from Squarespace to Shopify or BigCommerce. The whole process consists of three necessary steps and takes a little time. Stop hesitating, limitless functionality and robustness are one switch away from you. 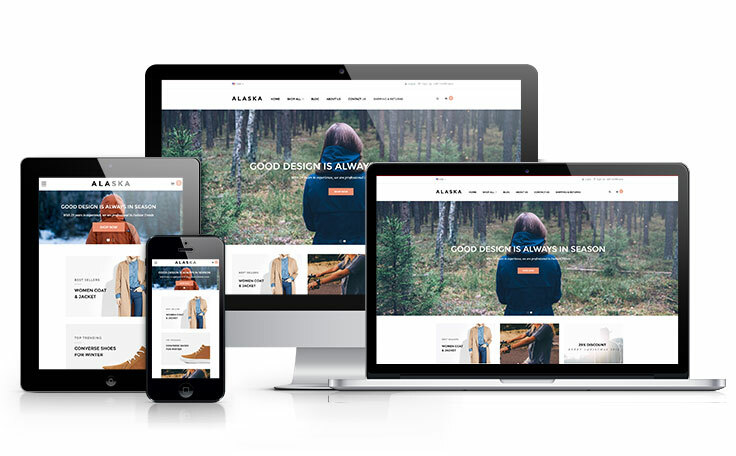 Making conclusion, we have to say, that if you plan on having profitable and truly popular eStore, you’re in need of the best eCommerce website builder. And it’s not Squarespace, which is better for launching or running a small-sized business. Besides, who'd guarantee scalable and continuous improvement if it weren't for a strong name like BigCommerce or Shopify to stand behind you? Who knows! Come out on top, start Free Demo to perform Squarespace export and be rewarded with professional looks and impeccable performance. Are you still just dreaming about BigCommerce or Shopify store? Make it happen with Cart2Cart!